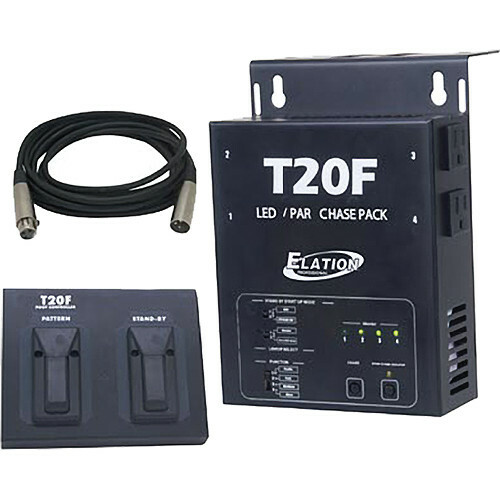 The American DJ T20F LED / PAR Chase Pack includes a Chase Controller, a Foot Switch, and a DMX Cable. The T20F Chase Controller is designed to chase LED par cans as well as traditional halogen par cans and is suitable for the working Musician or DJ. This is a 4-channel chase control pack with 20 built-in programs - 10 normal chase programs and 10 chase programs with fade time. It features DMX, 3-pin, and XLR In/Out for linking to other T20Fs; 7 pre-set scenes; a Standby (Blackout) function; and 20 built-in chases accessed by a chase button. The T20F chase controller handles a maximum load of 5A per channel or a maximum of 15A and features circuit breaker protection. A built-in, reversible, hanging / truss bracket is also included. The T20FC Foot Controller features a chase selection foot switch and a standby (blackout) foot switch. Box Dimensions (LxWxH) 11.8 x 8.3 x 7.9"